The distinct taste of rosemary and onions brings me back to my childhood, to those late summer afternoon family parties. Aunts, uncles, cousins, and siblings, all gathered around tables set out on my Aunt Mary’s deck, chatting, laughter echoing throughout the backyard. That buttery smell of freshly baked bread wafts in the warm air, intermingling with a succulent caramelized onion smell, and piney rosemary. My Aunt Mary carries a giant sheet tray out of the house and sets it on the table. She has rolled out pizza dough and scattered it with onions, rosemary, olive oil, salt and pepper. White pizza. Simple, perfect, and steaming, she cuts the pizza into squares and it is inhaled. I can close my eyes right now and imagine biting into the hot crust. Ahh, heaven. My salad today is an ode to that flavor combination: onions and rosemary. Or, I should say, more of a riff of that combo. 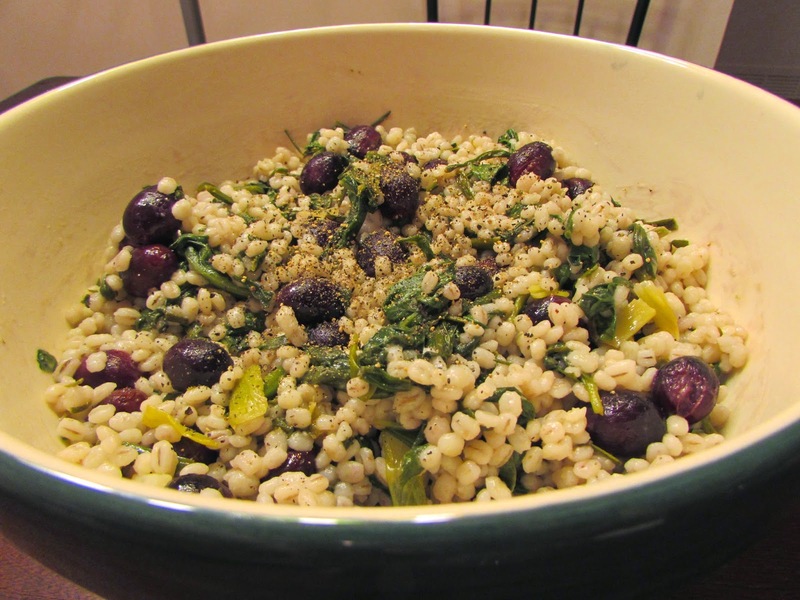 I sub green onions for white, add juicy roasted grapes, and stir it all up with some cooked barley. 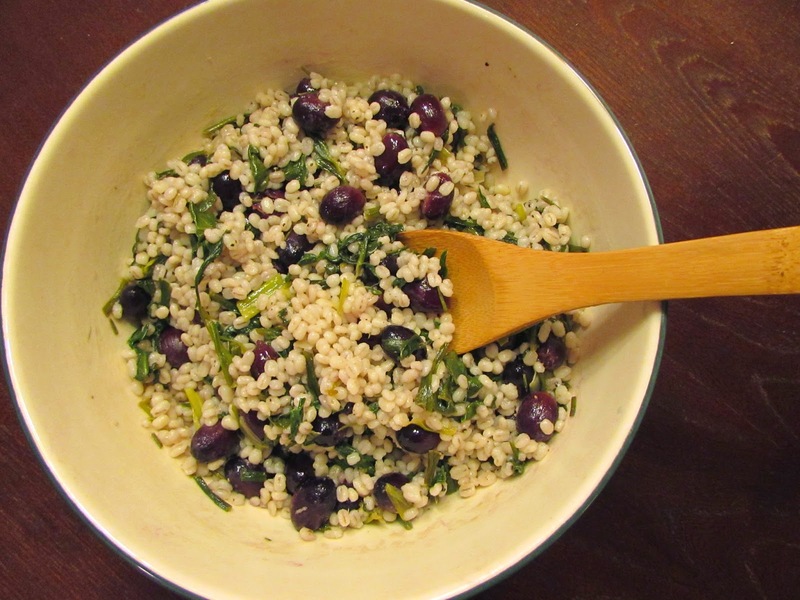 This is an extremely simple and satisfying recipe. Per usual, to make a meal, try adding in a 1/2 cup of your favorite legume to your bowl. Cannellini beans, lima beans, or chickpeas would be scrumptious. Heat the oven to 250 degrees F. De-stem the grapes. Place them on a baking sheet and sprinkle with 3/4 tsp salt. Bake for 2 hours. 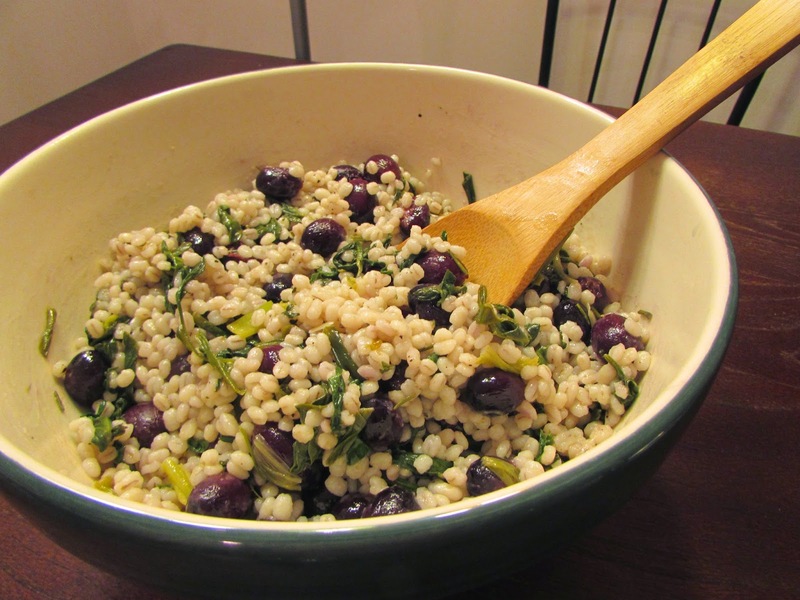 Combine barley, 1 tbsp rosemary, 1.5 tsp salt, and 3 cups of water in a saucepan. Bring to a boil, and then reduce to a simmer. Cook for 30 mins, or until tender. Heat 1 tbsp oil in a skillet and add the green onions and remaining rosemary. Sautee for 5 mins, or until the green onions are tender. Add in the spinach and sautee until wilted. 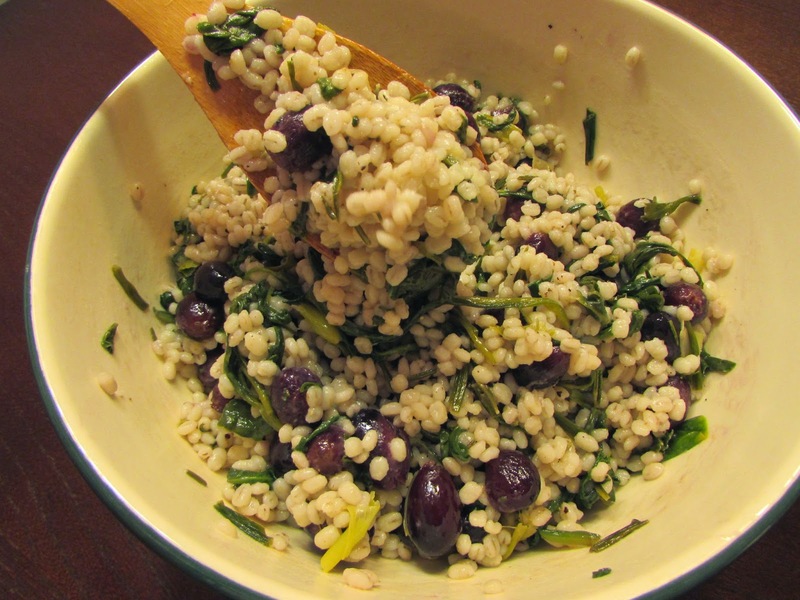 Pour the barley, green onion mixture, and grapes in a large bowl and mix together. Stir in vinegar and remaining 2 tbsp of oil. Add pepper to taste. Serve at room temperature or cold. Notes: 1) I used pearl barley, but for an even more nutritious punch, try hulled barley. 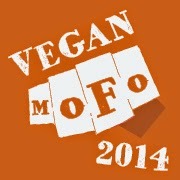 You can find it in the bulk bins at Whole Foods or online. Hulled barley is considered a whole grain, as its bran and endosperm layers are left intact. 2) I used 2 tbsp walnut oil for a toasty flavor and some omega-3s, and 1 tbsp olive oil, but feel free to use all of one. Thank you, Yiwen! 😀 I'm so happy you enjoyed it!